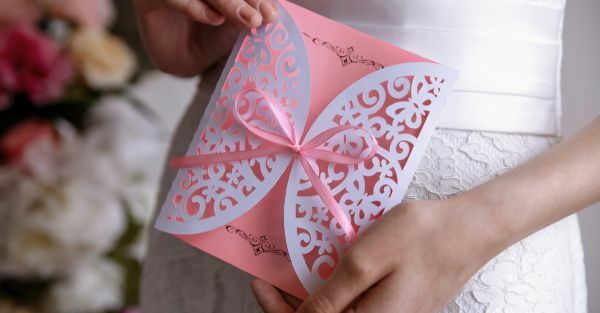 11 Mistakes You Cannot Afford To Make On Your Wedding Invitation! Even if you’re not usually a grammar nazi, we bet the last thing you want is a gaffe on your wedding card. You only get one chance to get it right, and your wedding invite (technically) is the first ritual when it comes to your wedding. Besides, your family may keep it for sentimental reasons. Just pay heed to these simple tips and you’ll have nothing to worry about! No matter who has checked it, get the card proofread by a bunch of people you think are a pro at grammar. We know there are card companies that do this day in and day out, but frankly – they will not be able to spot errors like date and time and spellings in names! We know, we know – it’s super tempting to sound fancy on your own wedding invite but we’d ask you to refrain! Most people won’t understand if the vocabulary is too posh (sorry, but it’s true!). Besides, the scope for error is highest when the card is too verbose. Avoid picking up words and phrases from the internet if you are not sure what they mean. In an attempt to sound sophisticated, you might end up making a fool of yourself. And nobody really wants that! It’s honestly not that tough to follow through with this easy tip. Just avoid all abbreviations to eliminate any possible confusion.Simple! First, you don’t want to put the wrong dates yourself. So triple check when sending out the details to the person designing your card. Second, your work doesn’t end there. Every time there is back and forth in terms of the changes (which is inevitable) you must recheck the dates. Just to be extra cautious, you could also have the main date in words. Don’t forget to also check the time for each event and the am/pm that follows. This small stuff can seriously make or break an event. We know you’re excited but that’s no excuse to come across like you are yelling at people as they read your card. Getting your punctuation right is a big part of correct grammar. Don’t use semicolons when they aren’t needed, and just capitalize the first letters as we do in normal, everyday English. The technical term for words that sound the same but are spelt differently and mean totally different things are homophones. Be careful of these sneaky little ones. They can be the toughest to spot while proofreading, and you may end up with a ‘knew’ instead of ‘new’ in the card. This won’t be fun if missed! We’d honestly suggest you keep the language on the card simple, succinct, and easy to follow. In the era we live in, there is always an excess of information, thanks to social media! Honestly, simple things have begun to stand out more than ever. Besides, people look straight for details when it comes to a wedding card; no one has time to sift through too much writing. Another tip is to make sure that even the map included should be proofread. It shouldn’t have any details missing or worse, incorrect. Same tip applies for the envelope and the bag, which come with the invite. Absolutely any text on the card (or the paraphernalia) is worth checking multiple times. Make sure you give the card to printers well in advance. If you rush the process you are bound to proofread in a hurry and perhaps miss some obvious mistakes. Sometimes, design can make a word appear wrong if not placed correctly. It is the designer’s job to make sure words are not split up in case they don’t organically have a hyphen. It is also a designer’s job to ensure the font size is legible and no word is getting randomly left off for the next line. The text on the card needs to come together as a whole.